Why Attend P2Psummit? Todayâ&#x20AC;&#x2122;s commerce is complex and in a constant state of change. It sometimes can feel impossible to make the right decisions for your business and find effective ways to connect with your customers. How do you find the right collaborative partners? What solutions providers will help you grow your business? What do you need to know to connect the dots and make the right decisions for your team? Join us at the 2019 Path to Purchase Summit (P2PSummit) where we will be Unraveling the Complexity of Todayâ&#x20AC;&#x2122;s Commerce Through Collaboration. Focused learning with applicable takeaways to start to activating back in the office. Community and collaboration through structured and organic networking. Hear from industry leaders on the keynote main stage and during our focused learning tracks. Discover the solutions you need to uncover growth. Celebrate industry innovation and success at the Shopper Marketing Celebration. New for 2019, The Path to Purchase Summit is by invitation only for qualified retailer(s) and consumer goods marketers. 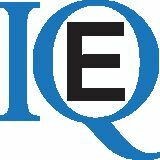 If you are interested in attending contact us at p2psummit@ensembleiq.com. Who Attends? To connect with the “always-on” shopper, you need to uncover new solutions and new ways to drive growth. You can’t do it alone. To keep up with the pace of change, you need the strength of the Path to Purchase Institute community to help you build new relationships and design new experiences. Path to Purchase Summit (P2PSummit) is where consumer goods marketers and retailers gather together to collaborate, learn and share insights to drive shopper engagement along the path to purchase. Bayer Healthcare Big Y Foods Brown-Forman Burt Bee’s Bush Brothers & Company BuzzFeed Cacique Inc. Clif Bar & Company The Clorox Co. The Coca-Cola Company Conair Corporation Constellation Brands Del Monte Foods Inc. It All Begins With Shopper Insights Vanessa Carlson Bueno, LALA U.S.; Rulynn Hansen, Epsilon; Carol Vella, Del Monte Foods Inc. Break & Solutions Experience Gallery Open New Product Innovation: Creating Success in a Shifting Consumer Landscape Larry Levin & Robert Tomei, Information Resources Inc.
What is the P2PI Faculty? Attendee surveys matter! Our distinguished faculty and faculty members have presented at past P2PI events and received an audience ranking of 3.4/4 scale. VP, Consumer Engagement Church & Dwight, Co., Inc.
VP, Shopper Marketing, Bueno National Retail Sales Sr. Director, The Coca-Cola Co. Marketing LALA U.S.
Sr. Director of Sales, Walmart Inc. Team Lead LALA U.S.
EVP, Marketing and Shopper Intelligence Information Resources Inc.
President, Marketing Sr. Shopper GM, Chief Sales & and Shopper Marketing Manager Marketing Officer Intelligence Del Monte Foods Inc. Enjoy Life Foods Information Resources Inc. Discovery often happens outside your comfort zone. It’s when you step out into the unknown that interesting discoveries start to take place, and no one knows this better than Destin Sandlin. Sandlin is an Alabama-based rocket scientist whose popular YouTube channel “Smarter Every Day” videos help people look at the world differently. Sandlin, a Ph.D. candidate at the University of Alabama Huntsville, spent 15 years as a flight test engineer for the U.S. Army and holds a patent in rocket design. In his videos where his trademark passion for and commitment to science and global outreach light up the YouTube screen, he explores topics ranging from the physics of how helicopters fly to “how Houdini really died” to how and why cats always land on their feet. In today’s rapidly changing, digitally disrupted world, thinking differently is a key to unlocking growth and success. Sandlin will take us on a fast-paced, whirlwind voyage of discovery to help teach us how to look at the world differently, how to let go of bias, and how to train your brain to change rigid ways of thinking. A Global Perspective on the Future of Retail Understanding retailers and shoppers is part of Andy Murray’s DNA as a veteran industry executive who knows firsthand all sides of the business, having worked in consumer goods, as an agency executive, and most recently at the world’s largest retail chain — on both sides of the pond. Previously Walmart’s SVP of Creative and Customer Experience in Bentonville, Murray joined Walmart’s British supermarket operator Asda in 2016 as Chief Customer Officer with the goal of bringing a new dimension to the UK chain’s strategy, merchandising and value proposition. Murray will be joining us at P2PSummit to share his expertise about the current state of retail and the future potential it holds in a candid conversation with FCB/Red president Tina Manikas. Using his unique global perspective, Murray will discuss the key trends that are driving strategy not only for retailers but also for product manufacturers. He’ll also examine how dramatic shifts in consumer behavior driven by technology have altered the traditional retailer-manufacturer relationship and the impact those changes are having on the shopping experience. Looking for a roadmap to future success at retail? You might find it here. Collaborating on the Future of Packaging: From Linear to Circular Tom Szaky, recycling expert, visionary and author, sets out to do the impossible - eliminate all waste. With a startling seventy-nine percent of waste present in landfills today that can be recycled, the CPG industry was poised for responsible reuse and recycling to propel the world towards eradicating overconsumption and waste. Hear first hand from Szaky about the Loop program rollout in the US and abroad, and how Loop aspires to be an engine for brands to catapult this new model of packaging, as well as an engine for retailers to embed the offering into e-commerce as well as physical stores. How Walmart Uses Data to Enable the Digital Enterprise How does Walmart, the world’s largest retailer, use data and science to deliver exceptional customer experiences, both on the newly launched Walmart.com and in its 6,000+ stores? Ray Boyle, VP Data Transformation, will discuss how Walmart as a worldclass technology company is leveraging artificial intelligence and machine learning to fuel growth and drive efficiencies. Finally, he will also expand on how Walmart is partnering with suppliers around the world to enable its evolution into a digital enterprise through data-driven decisions and automation. Three-time Olympic gold medalist and one of the top-ranked players in competitve beach volleyball history. As one of the most successful female beach volleyball player in the world, Misty knows that greatness doesn’t just get served to you. Known for her electric dynamic with long-time teammate, Kerri Walsh Jennings, her insights on teamwork, building trust and accountability are unrivaled. Misty will discuss the motivation and tireless efforts it takes to overcome obstacles, all while honing in on fundamental skills including teamwork, collaboration, grit and determination. And that’s not all! A handful of lucky keynote attendees will get something extra special. Do you think you could return a serve from one of the world’s best volleyball players? Wouldn’t you love to say you tried? Immediately following Misty’s closing keynote, attendees have the chance to participate in the #SummitServe2Misty challenge where raffle winners will take their turn at returning a serve from Misty on the Marriott resort’s picturesque beach. Shopper Marketing Celebration Awards Dinner & Reception Thursday, May 16, 2019 â&#x20AC;˘ 6:30 PM - 9:00 PM P2PSummit hosts the Shopper Marketing Celebration, the industryâ&#x20AC;&#x2122;s only combined event championing industry innovation and individual accomplishment for excellence in marketing communications. Shopper Marketing Effie Awards Presented in partnership with Effie Worldwide the Shopper Marketing Effie awards honor the most effective integrated marketing campaigns that engage shoppers along the path to purchase. Consider extending your stay - great amenities and activities abound! 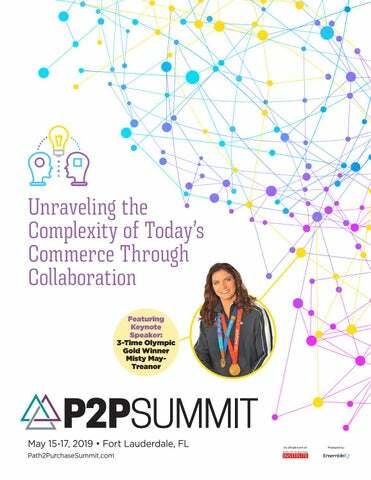 Pricing & Registration P2PSummit tickets include: all keynote sessions, up to 8 track sessions, all meals & receptions and the Shopper Marketing Celebration!